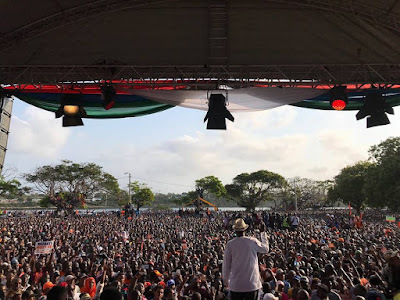 "No Al Ghurair and OT-Morpho, No reforms, no Elections" says Raila Odinga. -NASA - Bana Kenya News, Real African Network Tubanane. 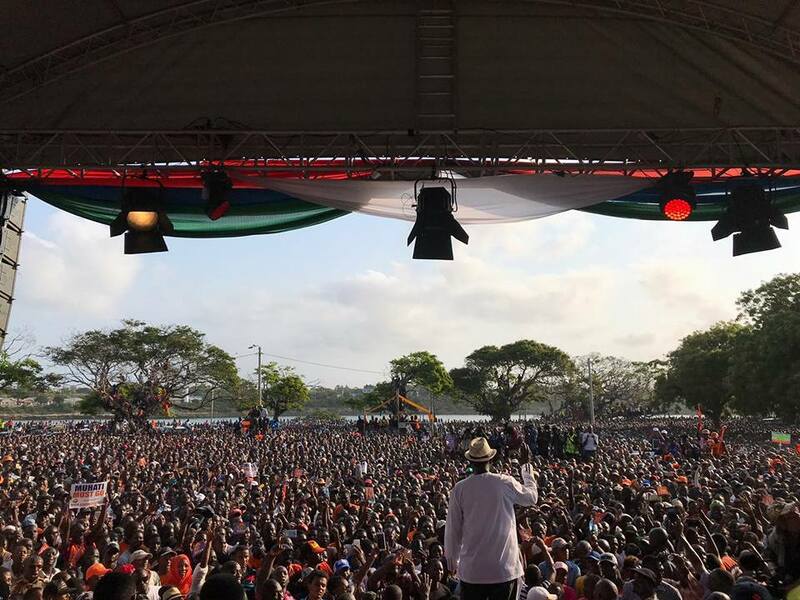 Raila Odinga and his team in Mama Ngina grounds, Mombasa alleged Jubilee for using state machinery in exploiting Kenyans. The Demonstration will continue until the IEBC vacate the offices. The Mombasa Governor Hassan Joho has declared that there will be no elections in Mombasa whether the IEBC takes their equipment to the Mombasa. The words were seconded by the Kilifi Governor Amason Kingi. "Ruto is so forgetful. He, alongside Musalia Mudavadi, Sam Ongeri, Martha Karua, Moses Wetang'ula and Mutula Kilonzo among others were the ones who sat in the talks. Raila Odinga was not present. How it turns that I wanted a coalition government is surprising." "We are not interested in a nusu mkate (half loaf of bread)...forget about it...we are the owners of the full bread," he said during NASA's mega rally at Mama Ngina Drive." "We wanted the servers opened but they refused. If the servers would have been opened we would have known the winner of the election and we would not be in the current state. Since they defied the order, they have to meet our demands." He said tenders awarded to Al Ghurair and OT-Morpho must be canceled and awarded to other firms before they can agree to participate in the election. "We had vowed never to complain over the August election but after the results were announced they are the ones who forced us to seek redress in court. We had not intended to do this," he said. "Fortunately Chief Justice David Maraga proved so courageous and delivered a ruling that hit Uhuru below the belt. He was shocked and after drinking himself silly, he branded the Judiciary all sorts of names." "Coast Region will not vote in the coming elections whether the IEBC chairman will come here or not." Mombasa Governor said. Raila Odinga is expected to continue with meeting several people and leaders in Mombasa. Despite the former senator Omar Hassan jumped ship to Jubilee, he was in the Nyali meeting with other leaders of the county.